• Our 4x6/5x7 wood frame uses a ''ship lap'' style for a worn finish look. • Ready to display your 4" x 6" photo in a white mat, just remove it to display your 5" x 7" image. • Red & Green snowflakes highlight "Joy Peace Love" in a red and green script. 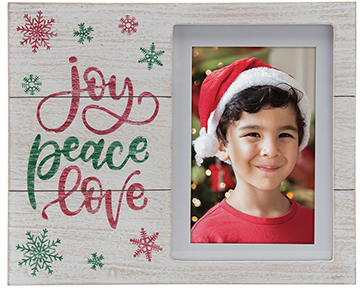 • Each Christmas frame is packaged in a colorful display box & includes an easel back. Our 4x6/5x7 wood frame uses a ‘’ship lap’’ style for a worn finish look. 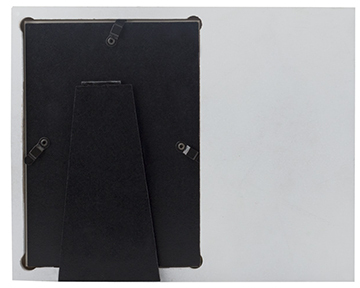 Ready to display your 4" x 6" photo in a white mat, just remove it to display our 5" x 7" image. Red & Green snowflakes highlight "Joy Peace Love" in a red and green script. 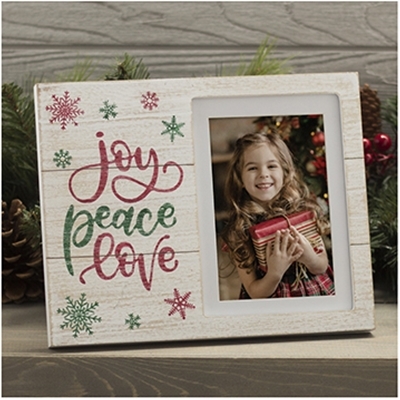 Each Christmas frame is packaged in a colorful display box & includes an easel back.